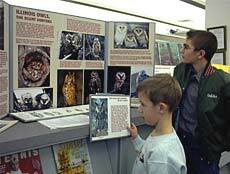 [FEB. 15, 2002] "Owls, the Silent Hunters," a pictorial exhibit from the Illinois Audubon Society, is on display now in the Annex of the Lincoln Public Library. The exhibit shows the eight types of owls, both common and uncommon, that may be seen in Illinois and tells something about the habits of these nocturnal birds of prey. Owls are silent hunters because they have very soft feathers that make no noise as they fly, so they can easily sneak up on their prey. They also have excellent hearing, binocular vision, strong feet and talons for capturing prey, and hooked beaks for tearing it into bite-size piece pieces. They see quite well in the dark, and because of their binocular vision (like ours) they can judge distance and movement very well. Because they cannot move their eyes, they turn their heads from side to side just as we do. Owls are beneficial to man because they eat mostly mice, rats and harmful insects. They can swallow small prey at one gulp and then regurgitate the bones and fur in small pellets. These pellets can be found on the ground under the places where owls roost. They are attentive parents and take good care of their young owlets. The most common owls in Illinois are the great horned owl, a large owl that can be as much as 25 inches tall and has ear tufts that resemble horns; the barred owl, also a large owl but without ear tufts; and the screech owl, 7 to 10 inches long, with small ear tufts. The screech owl is the one most often seen and heard near our homes. Barn owls, with their distinctive pale heart-shaped faces, are becoming rare. Like short-eared owls, they favor open farmlands and prairies. Snowy owls are occasional winter visitors from the Arctic, and long-eared and saw-whet owls are also more likely to found in Illinois during the winter. 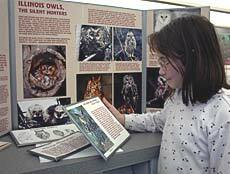 Other exhibits from the Illinois Audubon Society will be on display at the Lincoln Public Library in the coming months. The Illinois Audubon Society is the oldest conservation organization in Illinois, founded in1897. It works to preserve habitat, especially for threatened and endangered species, and sponsors educational programs, such as field trips and workshops, for both young people and adults. It is not part of the National Audubon Society. For more information about the Illinois Audubon Society, write to P.O. Box 2418, Danville, IL 61834-2418; phone (217) 446-5085; or visit the website at www.illinoisaudubon.org. [JAN. 18, 2002] Bored with winter? Lincoln Public Library presents "Board Games Rodeo" from 11:30 a.m. to 2:30 p.m. every Saturday through March 23 in the Pegram Community Room. If you are high school age through adult, you are invited to come and compete against your fellow "boardmeisters" in games of Monopoly, Risk, Scrabble, chess, checkers, Chinese checkers, backgammon, Trivial Pursuit and Yatzee. Remember to bring your gameboard so everyone can participate. Tri-County AmeriCorps volunteers serve as referees. For more information about this program, visit the library at 725 Pekin St. or call (217) 732-8878 or 732-5732. 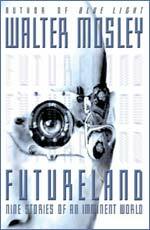 The corporate controlled, high-tech world of the year 2022 is the setting for Walter Mosley’s latest novel, "Futureland." Mosley is best known for his mysteries featuring the character Easy Rawlins, but in this novel, as in his earlier 1998 novel "Blue Light," Mosley leaves the genre he is best known for writing and again ventures into the realm of science fiction. "Futureland" gives us excerpts of the lives of nine very different African-Americans making their way in a time in which racism, classism and sexism still exist. Although the characters in this collection of stories come from different backgrounds, have different occupations and live in different locations, Mosley interweaves their lives throughout each tale, thus providing the common ground for the novel. • "Popo" Bent: The impoverished child genius who hears God’s voice in his homemade computer. • Folio Johnson: A private detective outfitted with an artificial eye that allows him access to information in the blink of an eye. • Fera Jones: A woman boxer who crosses the gender barrier in an attempt to become boxing’s world champion. • Dr. Ivan Kissmet: The man who imagines himself a god. • "Bits": The hacker convicted for "antisocial" behavior and sentenced to a licensing facility until it can be proven he is no longer a threat to society. • Professor Leon Jones: One-time history professor, cured of his addiction to the deadly drug "Pulse" by the only means possible, a living brain tissue transplant. • Frendon Ibrahim Blythe: prisoner of Sacramento’s’ newly instituted and almost fully automated Sac’m Justice system. • Neil Hawthorne: Who knew that employment was the only thing that stood between the working "M" and the living death of Common Ground. • Harold Bottoms: The man who lives in a world ravaged by disease, a disease that was 100 percent fatal to everybody that got it — everybody but people with at least 12.5 percent African blood, that is. [FEB. 19, 2002] "The Wizard of Oz," the spring play at Lincoln Christian College, will be presented in the Earl C Hargrove Auditorium on the LCC campus at 7:30 p.m. Feb. 21, 22 and 23. The play was written by L. Frank Baum, Harold Arlen and E.Y. Harburg. Directors are Tim Searby and LCC Professor James Allison. Tickets are $6 for adults and $4 for students. For groups of 20 people or more, the price is $1 off per ticket. For more information, call the Hargrove Auditorium office at 1 (888) 522-5228, Ext. 2354. [FEB. 14, 2002] "Show’n’Tell," a Community Theatre Showcase, will be presented from 8 a.m. to 5 p.m. on Saturday, March 2, in Decatur. The one-day event will be at the Shilling Community Education Center at Richland Community College. Theatre 7, Richland Community College and Illinois Theatre Association Community Theatre Division are hosting the program. For more information, contact Theatre 7’s Molly Shade, molshade@aol.com. [FEB. 11, 2002] Alison England was from California; the Pasadena Roof Orchestra was from England; and the Rhythm Brothers are not related, to paraphrase their introduction. The Rhythm Brothers is a quartet consisting of — at various times — two guitars, a banjo, a fiddle, a bass, a sousaphone and four silky voices. If that isn’t enough, add in "the music of Raul Reynoso and the humor of Doug Mattocks," and you get one entertaining show. 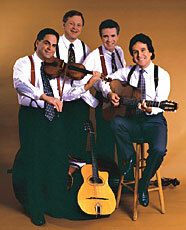 The Rhythm Brothers have played everywhere from Carnegie Hall to the Grand Ole Opry to Disneyland. And now they have graced Lincoln with their talented "plucking and strumming" as this month’s feature in the Lincoln Land Community Concerts series, at the chapel of Lincoln Christian College. The band consists of Raul Reynoso, Doug Mattocks, Paul Shelasky and Lee "Westy" Westenhofer. Reynoso is an extremely talented guitarist and songwriter. His songs have been described as "True World Music," since they come from his mixed background of Latin American culture, Los Angeles society and luegrass guitar. The band played a few of them, including "Matelot" and "Waneta’s Waltz." Mattocks, a comedian and guitarist, also plays all three of the major styles of banjo: four-string tenor and plectrum and five-string bluegrass. As the unofficial leader of the band, his quick tongue keeps the show moving. Shelasky is an accomplished fiddle player. His talent has taken him from the California State Fiddle Championships to international tours in North America and Europe. He also is a songwriter. The band performed one of his Discovery Channel-inspired love songs as an encore, "I Don’t Want a Praying Mantis Love Affair. "Westenhofer plays the upright bass for the band. His playfully driving rhythms give their songs, for lack of a better word, oomph. His renditions of "Jesu, Joy of Man’s Desiring" and "Dueling Banjos" played on the sousaphone are experiences no music lover should miss. For their sets at Saturday’s concert, the band chose a wide variety of tunes from all the ages of American string music. Traditional banjo tunes included "Oh! Susanna" and "Foggy Mountain Breakdown." The band’s smooth harmonies came out in the jazz tunes "What a Little Moonlight Can Do," "Chicken Ain’t Nothing but a Bird" and "Girl in the Little Green Hat." Bluegrass fans were delighted by "Rolling in my Sweet Baby’s Arms" and "Orange Blossom Special." Selections also included some Spanish favorites, such as "Malagueña." Wonderful music was not the only gift given to the audience. Many of the song introductions included brief music history or music appreciation lessons. For example, the guitars played by Reynoso and Mattocks were reproductions of traditional French guitars used by early jazz players. Reynoso played the "petite bouche" or "little mouth" guitar, which describes the opening in the body. Mattocks’ guitar, the "grande bouche" or "large mouth" version had a much wider opening, allowing a different sound. Music appreciation teachers or new style of string quartet, the Rhythm Brothers provided an entertaining and educational concert for Logan County residents. For more information, go to http://www.rhythmbrothers.com. [FEB. 7, 2002] Merely Players, in cooperation with the Richland Community College Forensicaturs (for EN sic ay ters), present the two-act adult comedy "Sylvia" in Shilling Auditorium on Feb. 14, 15, 16, 22 and 23. Showtimes are 7:30 p.m. for each performance. Tickets are available at the door or by calling 875-7211, Ext. 342. All proceeds from the production will benefit the Richland speech and debate team. Sylvia is actually a dog who speaks — and watch out when she does! A stray taken in by a couple in the midst of empty nest syndrome (among other hilarious complications), Sylvia chews on shoes and hearts with equal fervor. The opening performance, on Valentine’s Day, features a "non-blue night" with special and free admission to students with current photo IDs. The adult language will be modified for this performance only. The cast is composed of Richland’s four speech team coaches: Carrie Foxx as Sylvia, Joe Straka as Greg, Sam Straka as Kate, and Mike Huff as Tom, Phyl and Leslie. Karen Becker is the producer and director. Assistant director is Vicky Sue Gilpin, and technical director is David Gilpin. Running time is approximately two hours. For further information, or to enter your dog as the canine equivalent as star of the show, or for group ticket discounts, contact Sam Straka of Merely Players at 848-0045. [FEB. 7, 2002] Theatre 7 in Decatur announces an audition workshop along with auditions for the musical comedy "Anything Goes." Want to be on stage... but afraid to try? "Auditioning Conditioning" is a workshop offered by Theatre 7’s director, Mike Redlinger, to help nervous potential performers cope and provide them with helpful hints for better tryouts. The workshop will be on Saturday, Feb. 16, from 1 to 3 p.m., at T7’s headquarters, 131 N. Water in Decatur. Reservations are not required and there is no charge. This will be an excellent opportunity to become familiar with the music, history, highlights, cast requirements and rehearsal schedule for Theatre 7 upcoming production of the musical comedy "Anything Goes." The cast consists of 26 male and 26 female roles, ages 16-80. Auditions for "Anything Goes" are scheduled for Monday and Tuesday, Feb. 18 and 19, at 6:30 p.m., at the Decatur Civic Center Theater. Those participating should be prepared to read script, sing and dance. For more information about both the workshop and the auditions, call director Mike Redlinger at 864-2482.